10:23 am The famous road to Parent. After refuelling a few minutes beforehand in Mont St-Michel village, the signs indicating the road to Parent came into sight. Looking at the blue sign, I realized right away that this road was unusual… it read: “Warning! This road is used by heavy trucks. For your safety, use a CB on channel 10 to indicate your presence…” Not very welcoming. I took some time to put on my motorcycle pants (which I recommend for this route). What follows is a blend of my two rides to Parent: first with my Versys, then with the Rally. It's a bit unfair to the Versys, but it served me as a base comparison to evaluate the Rally. The Versys: an entry level crossover. The Rally: top of the line adventurer whose reputation is second to none. That being said, I learned a lot about the 2 bikes and I will try to transmit my observations as precisely as possible. After BMW Canada offered me the Rallye for a week, I wondered which type of road I should ride to test it out to its full potential. I have read here and there about the ride to Parent and I was hoping to have an occasion this year to make it - the stars were aligned, the Rallye was about to be in my driveway, I was on vacation, so be it! 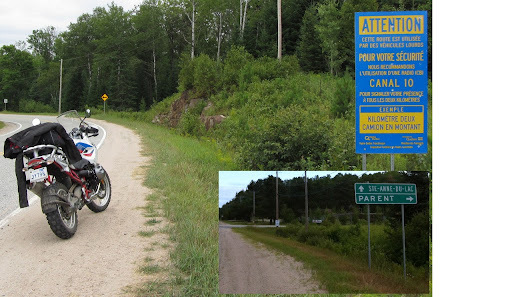 -the second time on July 27 with the Rallye, after my first ride with the BMW to Mont Tremblant Park. So I’ll be describing mostly the second ride. [A trail for the 1200GS Rally] This picture is the continuity of the15 East. The road also branched to the right. I rode a long way on this path. Not quite a spectacular picture, but yet this is what the motorcycle adventurers seek above all: a road with an interesting challenge, much like Scotch Road which I wrote about in part 1. After several miles, when I realized that the road did not lead to an end (I could go on and on), I turned around - there were two other attractions that I really wanted to see and I had to head back to Lake Superior road to get there. Anyway, for this road, I will certainly have other opportunities to see what's at the end of it. After a few kilometers, there is an indication for the “Croche” fall . There is a 300 meter walk along a charming forest path before you get there. Above, the “De la Diable” waterfall. A 15 meter (50 feet) high waterfall which is one of the principal attractions in the area. The intense downpour of the previous day increased the river flow which - according to frequent visitors - made ​​the falls more attractive. There is a beautiful forest trail (half a mile) that you need to walk to get there. I went back to Mont Tremblant Park with my family a few days later. The kids loved running on the paths that lead to each waterfall. We also rented canoes at lake “Escalier” which is a little further. And finally, we had a great time at the beach. It was truly a day enjoyed by all! … … … … … …yes, that’s it - a big smile on my face - on each gear. Of course, we are not talking sport bike performances, but the 1200GS 110 hps has quite a lot of punch at all rpms from first to last gear. However, what impressed me the most was the windshield efficiency – at high speed and with a hybrid helmet, air was still flowing around me. That is it for this ride. It was great, the bike was great, the weather was perfect…I could not have wished for more. I have created a video montage that shows all the ride shots with great music... Enjoy! and thanks for watching. Next ride: the real test.